What is Rhizoctonia Root and Crown Rot? Rhizoctonia root and crown rot is caused by R. solani AG-2-2. The disease begins to occur when plants are about eight weeks old (mid to late June) and roots can become infected throughout the season. Above ground symptoms of Rhizoctonia root and crown rot include yellowing and sudden wilting of leaves. Petioles of the outer leaves are blackened at the point of attachment to the crown and often lay flat on the ground. This disease frequently occurs on scattered plants or on several plants successively in a row. A dark brown-gray rot starts near the crown and spreads over the root surface. Symptoms vary from slightly sunken lesions scattered over the root to complete rotting and cracking of the surface. Rhizoctonia root and crown rot is favored when soil containing the fungus is thrown into crowns of plants during cultivation. 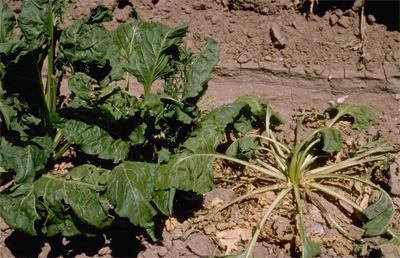 Quadris is the product of choice for controlling Rhizoctonia in sugarbeets. Proline provides control but is less effective	than Quadris. The most commonly recommended rate for Quadris is 10.5 fl oz/A in 30 inch rows and 14.3 fl oz/A in 22 inch	rows. The highest labeled rate in 30 inch rows is 14 fl oz/A and for 22 inch rows is 16.6 fl oz/A. In-furrow applications have	provided marginally better disease control than foliar sprays. The re-entry period for Quadris is 4 hours. Quadris should be applied in a 7 inch band. The earliest Quadris should be applied is between	the 2 and 4 leaf stage. Applications later than the	8 leaf stage will be less effective. Use 50 mesh screens (not 100 mesh). To limit the amount of water applied with in-furrow treatments nozzles such as	4002E, 2502 or 40015E can be used with pressures of 20 to 30 psi. Plugging problems are more likely with smaller nozzles	and lower pressure. Do not use 01 nozzles or reduce pressure below 20 psi. In 30 inch rows at 25 psi and 4 mph with 4002E nozzles the sprayer would put out 7.7 gallons per acre. For 22 inch rows with the same set-up it would be 10.5 gpa. Spray tips should be mounted after the seed drop and before the closing wheels. John Deere makes a nozzle mounting kit. We recommend a Quadris application for all fields. If planting a highly susceptible variety in fields with a history of	moderate Rhizoctonia problems two applications (in-furrow followed by a 6-8 lf application) are recommended. Similarly, when planting tolerant varieties in fields with a history of severe Rhizoctonia two Quadris applications would be recommended.